Find your hotel in Provence and the Riviera easily: nearly 1,200 hotels are listed, with customer opinions, availability and on-line reservation of your hotel room. 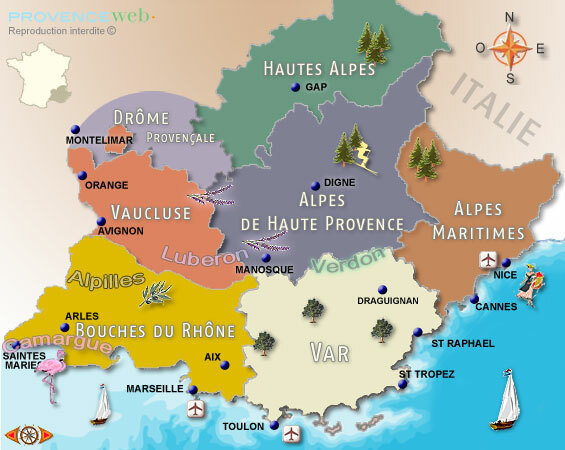 Selection of charming hotels, cheap hotels, hotels with a restaurant in Provence, Luberon, Camargue, Alpilles, Verdon and the Riviera, selected by criteria, located on our maps. All the hotels in Provence and on the Riviera are classified by their star rating. Find the perfect address for your Provence stay in a charming hotel, a luxurious and prestigious hotel, a Riviera palace or on the contrary in a little low budget hotel,in the Provençal hinterland or on the coast. Discover the special hotel offers, the hotel short-stay and week-end offers, the well-being offers at hotels with a spa, gourmet offers at hotels with restaurants, and last minute hotel offers. You will quickly find your hotel in Provence and the Riviera and will be able to visit the official hotel websites. 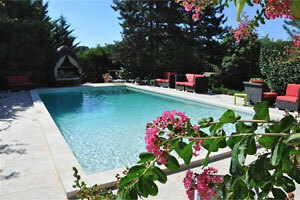 You can also book your hotel room directly in Provence via a hotel booking service. To find your hotel, from the map of the region above,first choose the department where you will be staying. You can then choose the city or village in the alphabetical list of villages with at least one hotel on site.. The menu on the right side of the page allows you to refine your search according to the criteria that are important to you: hotel standard with the rating from 1 to 5 stars, comfort of the air-conditioned hotel room or not, hotel restaurant with swimming pool and with room equipped with Wifi for example. If you are looking for a hotel with parking or garage to secure your car or motorcycle, you can integrate this filter into your research. Hotels with meeting rooms to organize your seminars are also mentioned to speed up your search if you are looking for accommodation for a group.. If your criteria are geographical you can choose your hotel according to the tourist basin in which you wish to stay even if you do not know the region well. For example if you are looking for a charming hotel in the Gulf of Saint Tropez, by clicking directly on the map you will find the 9 villages of the Gulf of Saint Tropez which have hotels in their structures and with for each of the villages the number of hotel on site. The hotels are classified by stars, the list of hotels gives their postal address, their telephone number and for some the link to their official website and for others the link to the partner booking center..
You can view the exact location of the hotel from the map that geolocates the property presented on the page and with a direct link to the official website of the hotel. It is very convenient for those looking for a hotel in the center or a hotel in the French Riviera near the sea and the beach. It is also indicated the hotels which are opened all the year with the picto 365. For a stay relaxation and to be well, you can mark the hotels in Provence or French Riviera with spa or jacuzzi. Those who go on holiday with their pet will be able to choose their hotel from among those who accept animals. Most hotels in Provence and Cote d'Azur are renovated to new standards and are equipped with rooms accessible to disabled or disabled. Tennis fans can choose hotels with private tennis in the hotel. You can find in the Camargue the hotels with horses at your disposal. Golf enthusiasts can find their hotel near a golf course.